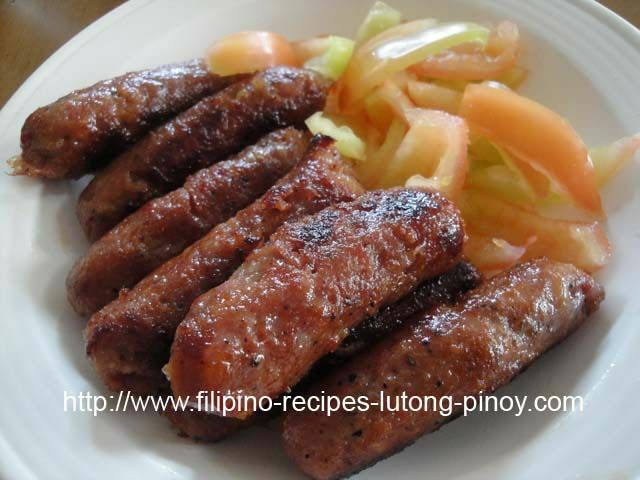 In the Philippines, one of the breakfast staples is the Chorizo or when you live in Luzon, it is called Longganisa. Since I am a Southern girl, we will call it Chorizo. This breakfast sausage is very popular all over the country, with each region having its own way of preparing it, as well its own ingredients and flavors. Generally, it is made out of pork, but nowadays, they also make them out of beef, chicken and even tuna. They are sold commercially in links encased in hog casing, or skinless or if they are just made at home, they are just formed into patties. Among the popular ones are the Longganisas from the towns of Guagua (salty to almost sour), Lucban (garlicky and slightly sour) and Vigan (garlicky and yellowish in color). There is also the Longganisang Hamonado which has a sweet taste. Whatever region it comes from or whatever it tastes, this food is here to stay because of its flavor and taste that will surely perk you up your mornings. Aside from eating it by itself, there are also several dishes that has the Chorizo as one of the ingredients like Pancit Canton and Paella. The possibilities are endless because its distinct taste will truly enhance any dish. This recipe is for the Skinless Chorizo. Combined with garlic fried rice and fried egg, it is popularly called Chosilog for CHOrizo, SInangag (fried rice) and itLOG (fried egg). 1. Mix all the ingredients in a large mixing bowl. Add the pork and mix thoroughly. 2. Cover and leave in the refrigerator for a couple of days for curing. 3. Individually wrap the chorizo by scooping a tablespoon of the mixture and laying it on wax paper. Form them by rolling and folding the ends. Put them in plastic bags and store in the freezer before cooking. 4. Cook the chorizo by removing the wrapper and frying in cooking oil and half cup of water. 5. Serve with garlic fried rice and fried eggs.